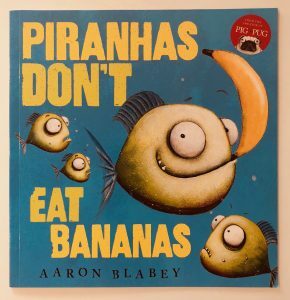 Brian is a piranha who loves nothing more than to tuck in to some fruit and veg – but his piranha friends think he’s bonkers because their favourite pastime is nibbling on tasty humans. Brian’s attempts at converting them fall on deaf ears and soon they’re fed up with him waving bananas and plums in front of their faces. He agrees to stop but on one condition – they need to actually taste one of his fruit and veg platters. Will he be able to convince them to swap knees for peas or will they continue with their carnivorous ways? Ivy finds this book hilarious, especially as it features the word ‘bum’. Always a winner with toddlers! The cheeky tone makes it fun to read aloud and the illustrations are simple but effective. Making piranhas look cute is quite an impressive feat!